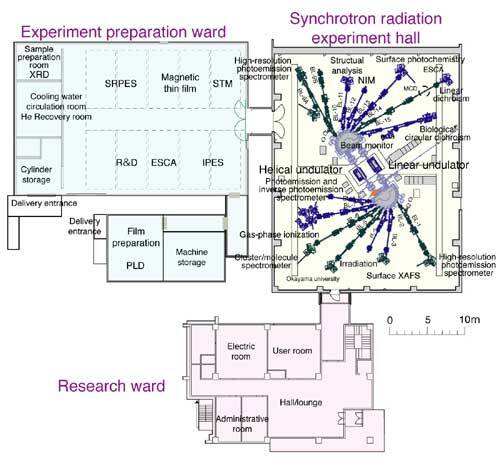 The Hiroshima synchrotron radiation center (HiSOR) is the only one synchrotron radiation facility that is attached to a national university in Japan. It was established in 1996, as part of the academic policies of the Japanese government. A compact 700 MeV electron-storage ring, called HiSOR (the whole center is often referred to as HiSOR), produces synchrotron radiation in the ultraviolet and soft x-ray range. This photon energy range is suitable for studying electronic states (energy-band dispersions, Fermi surface shapes, spin polarization, and many-body interactions) in solids. As described below, circular dichroism in the vacuum ultraviolet region is also very useful for the structural study of biomolecules in solution. The mission of the center is, therefore, to promote advanced research in the field of condensed matter physics using synchrotron radiation in the ultraviolet and soft x-ray range, as well as to develop human resources. In 2010, the center has been authorized as a “Joint Usage / Research Center” by the Ministry of Education, Culture, Sports, Science and Technology (MEXT). As a result of extensive research activities in collaboration with researchers from inside and outside of Japan, the center was graded “A” for the 1st term-end evaluation in 2015 by the MEXT. In 2016, the center's authorization as the Joint Usage / Research Center was extended for 6 more years. We call for proposals twice a year (Period A: April – October, Period B: November – March) to timely meet beamtime requests. At the same time, we reserve part of the available beamtime for urgent proposals of high scientific impact. During the fiscal year 2016, 240 researchers (actual number), including undergraduate and graduate students, completed 120 proposals. From 2004 to 2016, we have collaborated with researchers from 64 institutions in Japan, and 56 institutions abroad. About 20% of the researchers were from abroad, providing domestic students with an international atmosphere in the center. The accelerator system at the center consists of a 150 MeV injector microtron, a beam transport line, and a racetrack-type 700 MeV electron-storage ring (HiSOR). The circumference of HiSOR is 22 m, and the bending radius is 0.87 m in the normal conducting 2.7 T bending magnet, giving the critical photon energy of 873 eV (1.42 nm). There are 16 beam ports: 2 for undulator beamlines, 14 for bending magnet beamlines. We have constructed 15 beamlines in total including 2 beam monitoring beamlines. On the two straight sections of HiSOR, we have installed a linear undulator and a variably polarizing undulator (APPLE-II type). Each year, we provide about 1,500 hours for user beamtime. In the mid-term plan (2016-2021), we focus on the following priority research areas. On the linear undulator beamline BL-1 (photon energy range: hν=22-300 eV), we have installed a unique rotatable angle-resolved photoemission spectroscopy (ARPES) system to investigate the symmetry of wave functions in solids, and fine electronic structures derived from the electron-phonon interaction near the Fermi level. On the variably polarizing undulator beamline, we have constructed two branch beamlines BL-9A (hν=5-35 eV) equipped with an ultrahigh resolution ARPES system and BL-9B (hν=16-300 eV) equipped with highly efficient spin- and angle-resolved photoemission spectroscopy (SARPES) system. BL-9A has enabled many studies on the fine details of the electronic states on the meV energy scales in high-Tc cuprates or strongly correlated materials. BL-9B, with high momentum and energy resolutions with variable photon energy, allows examinations of the three-dimensional spin texture of magnetic materials, as well as spin texture induced by the strong spin-orbit interaction in topological systems. BL-9B attracts many proposals, and more than half of the beamtime is allocated to collaborators outside of Japan. On the beamline BL-12 (hν=2-10 eV), we have installed a vacuum ultraviolet circular dichroism (VUV-CD) beamline for the structural analysis of biomolecules (proteins, sugars, and nucleic acids) in solution. This experimental technique was developed at our center and has been recognized as a powerful tool to clarify structures of a wide range of samples under different solvent/environmental conditions. Beamline BL-14 (hν=400-1200 eV) enables users to prepare atomically-controlled thin films or nanostructures on substrates in situ, and to characterize their magnetic and electronic properties by measuring the soft X-ray magnetic circular dichroism (SXMCD) measurements. We are also developing a design for a compact low-emittance electron storage ring called HiSOR II for our future plans. Being a part of the graduate school of science, Hiroshima University, the center is involved with fostering human resources not only through lectures and seminars, but also through research activities using synchrotron radiation. Undergraduate and graduate students can participate in domestic or international collaborative research, and directly learn about the latest research activities in the field. Furthermore, the center hosts the Hiroshima International Symposium on Synchrotron Radiation (HiSOR symposium) every year since inauguration. In the 21st HiSOR symposium held on Mar. 2-3, 2017, there were 13 oral presentations and 43 poster presentations, and 100 participants. Distinguished researchers in our priority research areas were invited and gave lectures. Students presented their scientific achievements in the poster session. In a flash poster session of the symposium, all the students can give a short presentation to advertise their poster in English. To encourage students, we present the best student poster awards to students in recognition of their excellence in scientific research and presentation. We accept many visitors, including junior and senior high school students and international students. In 2016, a total of 1,131 people visited our center. Began collaborative research with Mazda and Hamamatsu Photonics K.K.